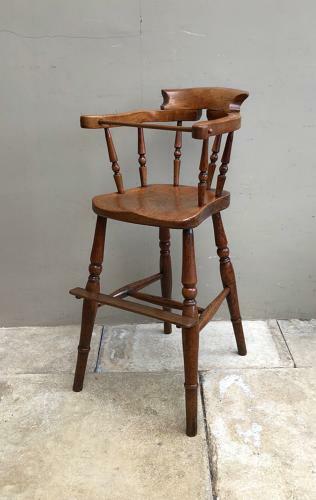 Wonderful Victorian Elm & Beech Childs High Chair. Superb Quality, Condition & Colour. It is unusual with a Captains Chair back...the height is perfect to have at a table. Has had some repair work and now all sturdy & strong, no worm. Just a lovely country piece. The bar slides in and out at the front or it can be removed so the child just sits to the table.